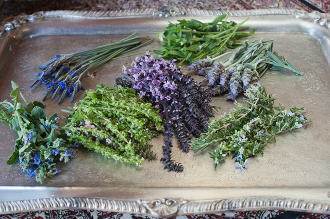 Beautiful, aromatic and extremely flavorful herb flowers mix; Usual Mix includes Basil, Lavender, Thyme, Rosemary and more; Lovely accent to salads, meat dishes, desserts and cocktails. A Gourmet Sweet Botanicals Favorite! Please Note any flowering herb preferences in Delivery Date/Special Instructions section while placing your order as this mix may change from season to season. Please contact us with inquiries at info@GourmetSweetBotanicals.com.